Over the next few months, I’ll be stopping in every once in a while to showcase a favorite section from one of the 15 guides. My hope is that it will help you find the perfect gift for under the tree! Aw, the terrible terrific twos- if ever there is a time in a child’s life that an engaging toy is worth it’s weight in gold, this is it. Of course, the tricky part is finding that magical item that will actually hold their attention for more than 5 minutes and help foster some developmental skills along the way. 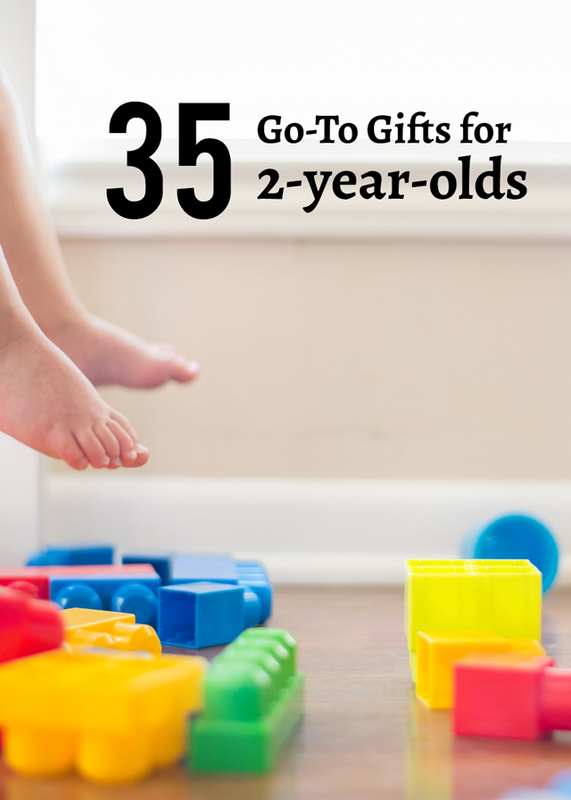 We’ve bulked up the list a bit this year, so here area the first 20 of 35 picks- each and every one is sure to delight and engage the two year old in your life for longer then you’d believe. Enjoy! I still remember my son receiving his first set of award-winning Megabloks for his first birthday. It took him a little while to figure out (kids typically grasp block building somewhere between 12 and 18 months), but once he did he started building like a mad man and never looked back!All my mom friends and I love Mega Bloks for our youngest kiddos, even more than the classicLEGO duplos. The locking mechanism is just a little bit easier for beginners to put together and pull apart. Plus the colors are beautiful and the zippered bag is very handy. This deceptively simple toy is so much more than it appears. Parents and teachers rave about how the hours and hours their kids spend shooting things through this heavy duty tunnel. This is a great toy to get kids hypothesizing about, “what will happen when I… (put something heaver in, tilt it higher, put more than one thing in it, etc…) When my friend first introduced me to the tot tube, I really liked the idea but wondered if it was worth the money (couldn’t we essentially do the same thing with a cardboard wrapping paper tube?). What I like about this, though, is thatit’s a lot more durable than a cardboard tube, it’s wider shape accommodates bigger sized cars and balls, it canbreak apart for easy storage or you can attach more than one for a super long tunnel, and the kids can see through it- making it so much more engaging. Read the reviews on this one and I think you’ll be sold. One of the most surprising things about having toddlers and preschoolers is seeing how much they absolutely LOVE to clean! This is another item we’ve had for a few years now. It’s very inexpensive and the kids really enjoy breaking it out to help with clean up when the opportunity arises or just using it to play pretend. Every toddler we know has this set and totally adores it and our 18 month old completely freaks out when he can’t find it. Educational Insights Magic Moves Talking Electronic Wand $21.99 (18 months – 9 years) Normally I’m not big on electronic toys with lots of sounds and lights, but when said toy can help my kids get rid of all their pent up energy inside on a stormy day, it becomes my new best friend. This inexpensive magical wand uses 90 silly commands (sway, creep, stomp like a dinosaur, leap) and 26 songs, along with a light show to get kids moving. This is one of those rare toys that’s great for siblings of different ages to play together (my 7-year-old, 5-year-old, and 18 month old all love it). It will keep the bigger kids interested (who doesn’t like having the mic and being the star of the show?) while developing listening skills in the younger set along with enriching their vocabulary and ability to follow directions. I know what you’re thinking – a one or two-year-old is too little to enjoy a big dramatic play toy like this. Once upon a time, I would have agreed with you – but then my baby boy starting pulling up and I got to see first hand how much he LOVES opening and shutting the doors, turning the knobs, taking the sink in and out and putting food in and out of all the compartments. Plus, I know he has years of enjoying it still ahead of him. The ideal time to buythis toy is around 18 months so yourchild gets the maximum amount of years out of it. We initially bought this for the big kids several years ago when they were 1 and 3 and couldn’t be happier with it as it still gets lots of play at ages 4 and 6. I really like the look of the thing and I think the vibrant red is nicely gender neutral. Despite a small footprint, this kitchen still has all the amenities and both my kids enjoy regularly playing at it simultaneously. (Side note: people sometimes ask if kids will get too big for this smaller kitchen – mine are 95th percentile in height and haven’t had an issue). If you’re looking for a big wow gift from Santa (or parents or grandparents) this could very well be it! I had to include this toy vacuum because it was the absolute favorite of my son AND literally every other kid in his toddler group when he was 2 to 3 years old. The class had 3 of them and there were still daily tussles over them between the kids… and that’s without even being allowed to have the batteries in them. (In fact, if you’re not a fan of toys that make sounds I’d suggest just never putting the batteries in – this will still be a fantastic pretend play toy). ThisDisney Minnie Bowtique Vacuum is also really cute and gets great reviews if you’re looking for something a little more, what’s the word, pink! This is a new addition to this list this year (and somewhat of a “doh” moment for me). We’ve had several playhuts throughout the years – some cheap, some expensive but more durable – all extremely successful in keeping my kiddos of varying ages happy and busy. Nevertheless, I still forgot them for this list until I polled my mom friends and they ALL brought up the power of the playhut. Because these guys can be so inexpensive, they’re kind of a no-brainer for me if you have the space. Currently my favorite are this Thomas version, this Beauty Boutique, and this Princess Castle with Glow-in-the-Dark Stars version. Also, I LOVE playhuts with tunnels like this one (more than doubles the fun). In fact, if you don’t have the space to have a play hut setup all the time, I would definitely recommend a tunnel that you can tuck away when not in use. I think a balance bike will probably make it onto my gift guide for as long as I’m writing them. Both of my kids have been zooming around on bikes since they were 2 years old thanks to this genius idea of taking away the pedals and letting the kids pick up their feet and balance when they’re ready. I also really love how lightweight they are. Both kids could easily pick theirs up and carry it around as soon as they started using it. In previous years I’ve always recommended the Strider Balance Bike because that’s what we have and it’s worked great for us. The only drawback has been when the kids get really good at it and can’t stop when going down steep hills due to the lack of brakes. This FirstBike version comes with a hand brake that could come in very handy for those scenarios (no pun intended). This is the first board game made specifically with young toddlers in mind. Toss the big plush cube and identify which colored side faces up. Choose a matching color card and perform the simple activity shown, such as “Make a happy face”, “Moo like a cow” or “Find something blue”.Designed for parent and child to play together, Roll & Play strengthens bonds and builds confidence while encouraging creativity, active play and gross motor skills. This seems like a great option if you have a preschooler who wants to play a family game with his or her younger sibling too. For another great young-toddler-friendly game, checkout Thinkfun’s Hello Sunshine Game $15.20 (18 months – 3 years) as well! We bought our son a train table for his 2nd birthday and we always say it’s one of the best purchases we’ve ever made. For over four years both he and his sister played with it several times a week. And now his 18 month old brother is really starting to get into it. At 4 years old our oldest was able to completely construct the track by himself using the map and that added a whole new level of building play to this fantastic toy. I think the model we bought has been discontinued but this one is the same brand and has all of the same key components: a bridge, waterfall mountain, helicopter landing pad, and the all-important drawers for storing all the little pieces. If you’re going to be putting your train table in main living space, you may want to spring for the more expensive KidKraft Metropolis Train Set Table with Trundle Drawer. It’s got a nicer “furniture” look (and that double-decker bridge is pretty cool too). Also, over the years we’ve amassed quite a collection of Thomas trains to go with this table. Read the Rest of the List & See Picks #21 – #35 Here!